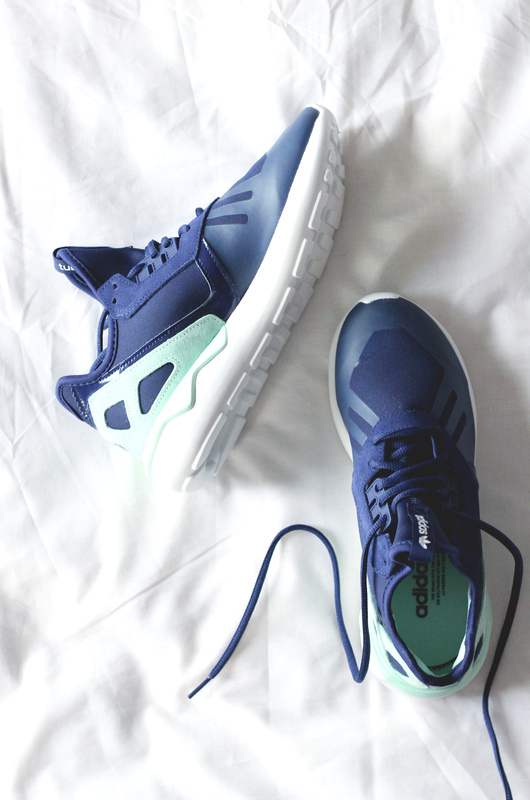 I’m so excited to share with you my latest pair of sneakers – Adidas Tubular Runner in blue and mint!! I love them so much and can’t wait to finally take them for a spin around town or maybe for a party? Another great bargain on a pair of shoes that I order from Zalando (maybe I have a problem?!) and fall in love with! These are my first blue shoes cuz I usually pick black or grey but I thought it would be cool to mix it up a little. They go great with jeans as well as skirts and dresses but most importantly fit into my grey wardrobe obsession lately (I realized I have so many grey clothes!). I’ll try to shoot an outfit post in the upcoming week to show you guys! These sneakers are super cute!! I love them! I love the colors – so cute!! Omg! Love the mint details, so cute!! Love your images~ how do you get your photos so white and bright in the background? Do you use a photo filter or special lighting?